To ensure that Frontify really becomes your brand’s cozy home, you can customize the Media Library to your needs. Read along to find out how. Enter the frontend view of your Media Library, and switch to edit mode. A “Search Settings” button and a "Layout Settings" button will then appear on your page. Click it to enter the settings section. 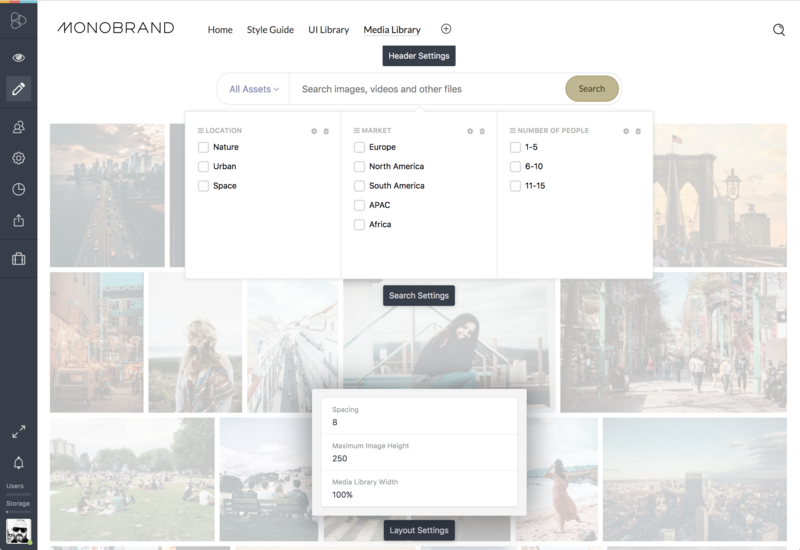 In the “Layout Settings” , you’re able to change the spacing between pictures, the height of your images, and the width of the Media Library. You’re also able to configure your search bar by adjusting general properties like border width, and button color. You can also dive into details, changing the looks of your search bar borders, and the box shadow. You can further define which assets you’d like to display. This way you can, for example, easily exclude expired assets from your Media Library. You can also modify your facets, if wished. Change the width of them, and define which color your facet checkboxes should have. It’s not indispensable, but why not customizing your Media Library from A to Z, right? In case you have any further questions, please don’t hesitate to contact our support team.